"On Thursday of last week a tragic accident occurred at Moora when Lewis Fairclough, a young man, accidentally shot himself with fatal results. It appears that on Thursday afternoon the unfortunate young man intimated his intention of going shooting and when he did not return home that evening his mother was not unduly worried as it was thought that he was probably spending the evening with his grandmother. However, when he did not return on Friday morning a search party was organised and his remains were discovered that afternoon. An inquest was held and a verdict of accidental death returned. A widow, mother and one younger brother are left to mourn their loss. The late Mr. Fairclough was in his early twenties and was particularly popular with the young people of the Moora district, being an outstanding athlete. He was a nephew of Mrs. Sheridan, of Carnamah." 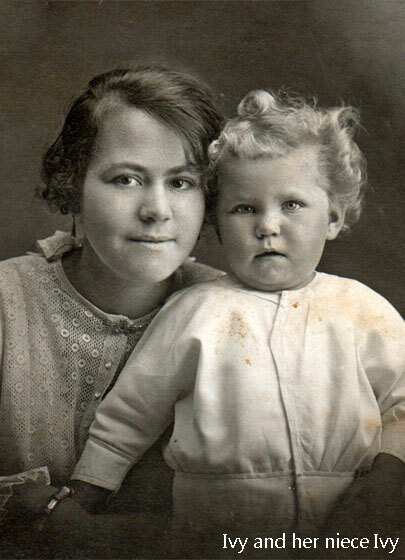 The below photograph of "the two Ivys" is of Ivy and her niece Ivy Myrtle FAIRCLOUGH.